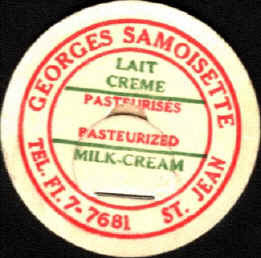 "From 14 quarts sold the first day to 70,000 today"
The founder of the Samoisette Dairy was born on Christmas Day, 1895. He was married to Georgiana Lemaire. They had 2 daughters and 3 sons, Jacques, Gaston and Raymond. "In 1935, the milk was delivered that way. 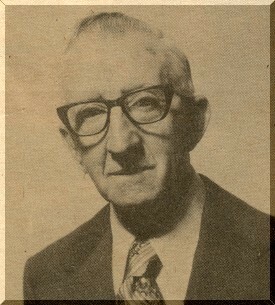 On the first day, Georges sold 14 quarts of milk"
Georges was 40 years old. Not too bad for the first day! But still, he needed a lot of courage and determination to continue. 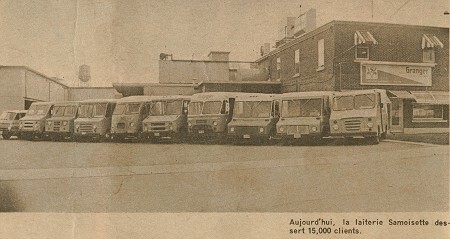 From 1936 to 1961, the dairy was located at 82 Jacques-Cartier street in Saint-Jean sur Richelieu and its growth was slow because there were several producers delivering milk; as a matter of fact, in the mid forties there were 21 dairies delivering milk in the St-Jean area. In order to get its slice of the pie one had to cut cost. 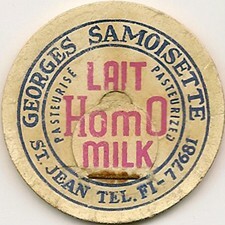 In 1940, his young sons Raymond and Gaston started to help at the dairy and with the delivery of milk. Eventually, they both worked full-time at the dairy. In the middle of the last century, legislations became more severe and demanding in order to protect the producer, the retailer as well as the consumer. 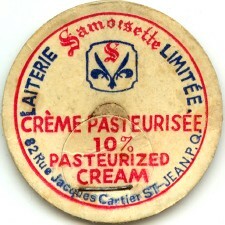 All dairies had to be inspected and have an operating permit which the Laiterie Samoisette obtained on April 7, 1948. 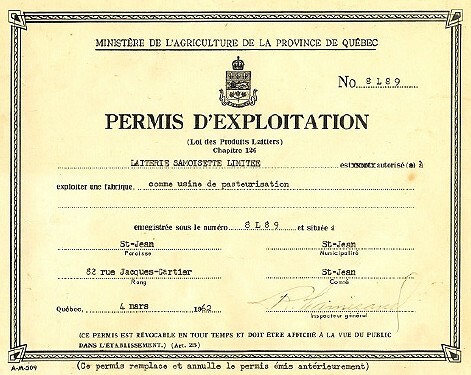 Raymond was an astute young man and, in order to become more competent, in 1953, he registered at "Ecole de Laiteries de St-Hyacinthe". Raymond loves public. He organized guided tours of the dairy. Everyone must wear a hat! 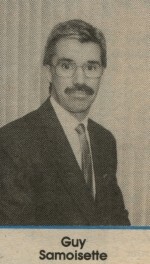 Years went by and the family business grew well. 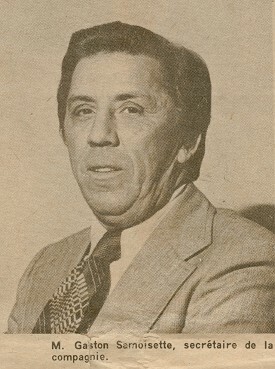 Raymond married Claire Therrien and they had one daughter and five sons. 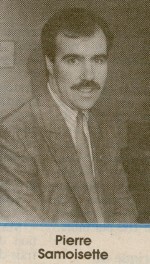 Two of those sons became partners in the dairy business; Pierre became the production manager and Guy the sales manager. 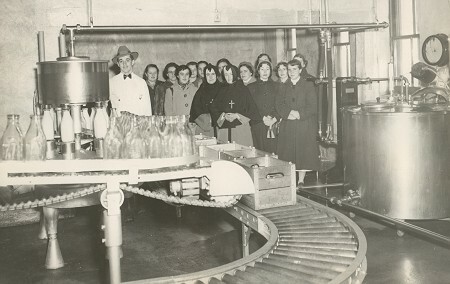 In 1961 the dairy had 4 milk runs and started pasteurizing milk; six employees then worked at the dairy. Later on, 10 more milk runs were added to the 4 existing. They purchased, in 1965, the Bedford Dairy and they then had 18 milk runs. 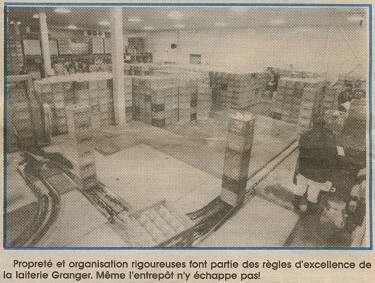 On April 1, 1972, the Laiterie Granger became part of the Laiterie Samoisette which then doubled its sales. 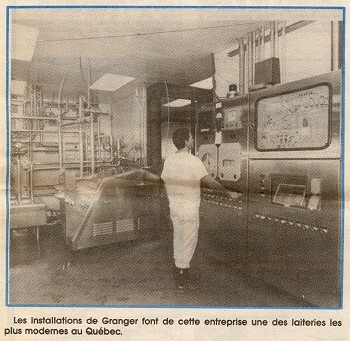 The dairy moved to the former site of the Laiterie Granger on Bouthillette Street in a more spacious and prestigious facility. 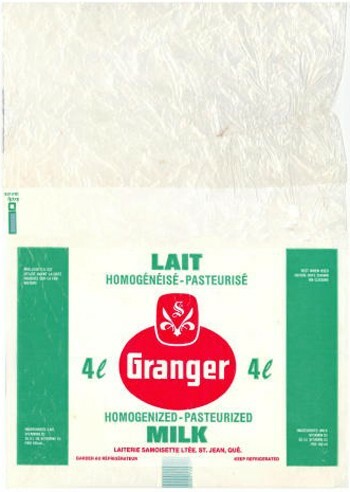 The name Laiterie Samoisette was then discontinued and the name Laiterie Granger was then used. 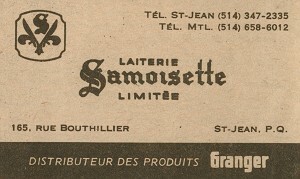 By business strategy, Samoisette Dairy became "GRANGER PRODUCTS DISTRIBUTOR" as shown on business cards. Starting in 1973, it was decided to sell homogenized milk only. 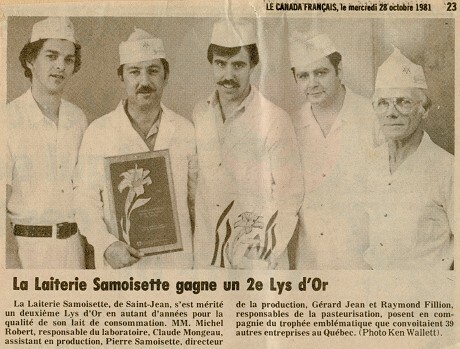 In 1975, the Gougon Dairy from Richelieu was purchased by the Samoisette family and they then had 43 milk runs. In 1976 they added six new milk runs when Cowansville Dairy was purchased. 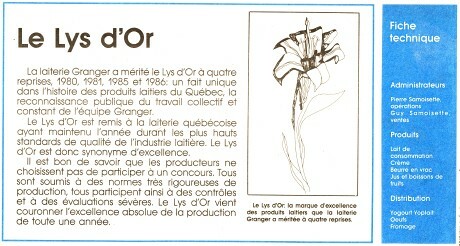 "Success" was a word cultivated by the owners of the dairy and they won on several occasions the Lys D'Or. "Click" fiche technique, see Pierre and Guy Samoisette's name! Long time after the acquisition of Granger Dairy by Samoistte Dairy, the name "Granger" still used by residents. 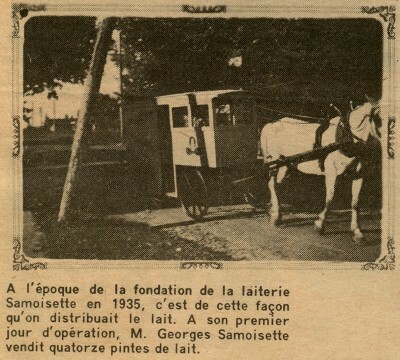 In 1978-79, Samoisette Dairy owns more then 40 vehicules! 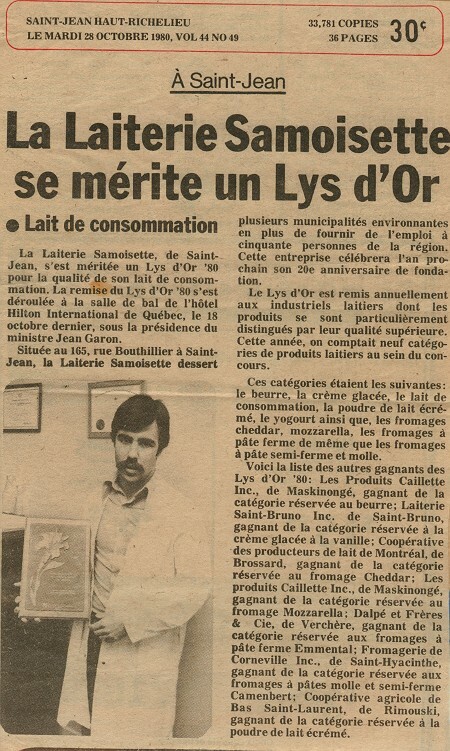 On October 28, 1980, "Le Canada Français" reported that the company was managed by the Samoisette family but they had sold in 1979 part of the capital to "Les maîtres producteurs laitiers du Québec"; in 1982, Agropur and Purdel purchased the company and Raymond managed the company until 1984. 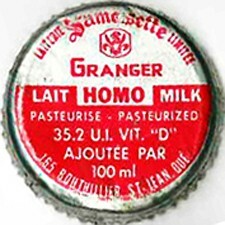 Actually (1980), about 95% of the population of St-Jean drinks Granger(Samoisette) milk. Every year, they distribute about 16 million kg. of milk to consumers from Châteauguay to Cowansville. 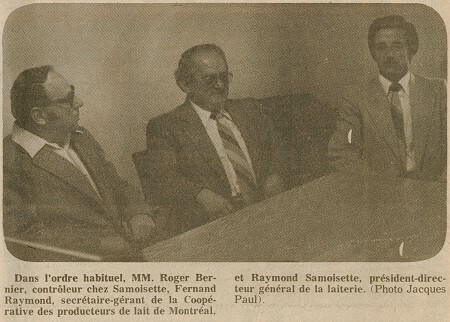 Raymond Samoisette: "Only my father's quarts were identified to the Dairy"